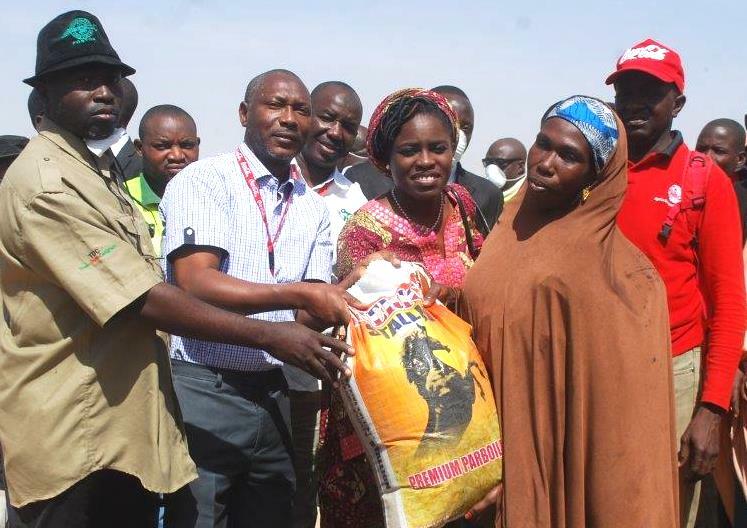 In furtherance of its Corporate Social Responsibility commitment to promote better and sustainable living, Nigerian Bottling Company Ltd (NBC), has donated relief items to residents of the Teachers’ Village Internally Displaced Persons (IDP) Camp in Maiduguri, Borno State. The handover of the relief materials recently took place within the IDP Camp premises and witnessed a large turnout of the camp residents, community leaders andtraditional rulers. Speaking at the formal hand-over ceremony, Mrs. Sade Morgan, Legal, Public Affairs & Communication Director for NBC, said, “The gesture is a combined initiative of NBC Management, NBC branch of the Food, Beverage & Tobacco Senior Staff Association (FOBTOB) and National Union of Food, Beverage, & Tobacco Employees (NUFBTE), together with personal contributions from individual employees of NBC. “At NBC, one of our major aims is to continuously champion and drive investment in the well-being of our host communities through intervention programmes in the areas of skill acquisition for the youth, women empowerment initiatives, provision of sustainable water solutions to households and other environmental sustainability initiatives,” Mrs. Morgan stated further. In response to the kind gesture from NBC and its Unions, Mr. Tijjani Abba, Borno State Coordinator, National Emergency Management Agency (NEMA), commended efforts of the Nigerian Bottling Company Ltd (NBC) in assisting the government in providing welfare services to the IDP camp and also encouraged other well-meaning Nigerians to tow the same line. The relief items donated include household utilities, food items, clothing, toiletries, medical aids, footwear and educational materials, informed by an assessment of the IDP’s needs and critical for maintenance of the camp. The contributions made will go a long way in improving the social well-being of the camp residents, supporting government, its agencies and other corporate bodies in addressing the challenges of internally displaced persons in our society.